Novices can benefit just as much from competition as Intermediate and Advanced lifters, if not more. With proper expectations and sound coaching, the novice should be encouraged to compete, for what can be gained on the platform is of lasting value. Lifter: Samantha Cordova. Photo by Petra Smitkova. Why wait for an “important” meet – where the expectation of PR attempts, qualifying totals, or medals hang over the athlete – to get a lifter’s first meet under their belt? Indeed, why wait for any expectations whatsoever? Wouldn’t it be nice to go into a first meet with only the goal of making attempts? Wouldn’t it be nice to have “just compete” be the focus of the day? Novices have no reason to expect any performance milestones at their first meet. As a novice, the first meet can be a low pressure/high reward way to get a feel for competition. With less reason for performance anxiety, the novice can focus on the workings of the meet: navigating the warm-up room and the platform, making attempt selections, eating and resting – important elements of a successful meet for any level of athlete. A novice who enters their first competition learns important information about the structure of meets and how they respond to the pressure of the platform, and can make mistakes in a low stakes scenario. 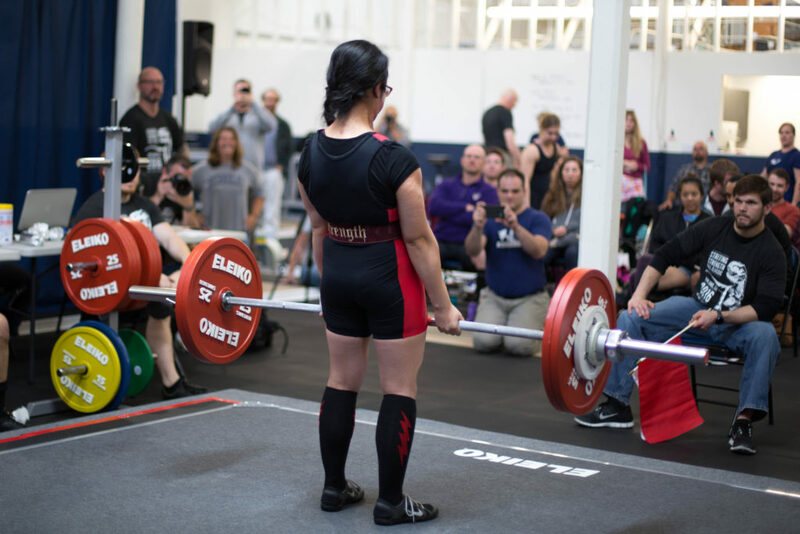 When an “important” meet comes along – when the athlete has a chance to win their weight class, hit a milestone squat, or qualify for nationals – the experience gained in their first meets where none of these things were on the line will be of great help when months or even years of training come to fruition. Lifter: Patricia Lee. Photo by Petra Smitkova. Not all novices are able to train in the company of advanced lifters. Exposure to very strong people expands the definition of possible. That coveted 225 pound squat changes from a lifetime goal to just another milestone on the road to 315, or 405. Thus the novice lifter begins to envision their training extending past this meet. Training can be established in the context of athletic performance, rather than just what is accomplished in the gym or the garage. Powerlifters come in all ages and sizes. Where other sports have a specific body type that is most effective, you can find many different kinds of lifters at any given meet. The novice may have some idea of “what a powerlifter looks like” but this will be quickly shattered. The athletes do all have one thing in common: strength. Strength is for everyone. 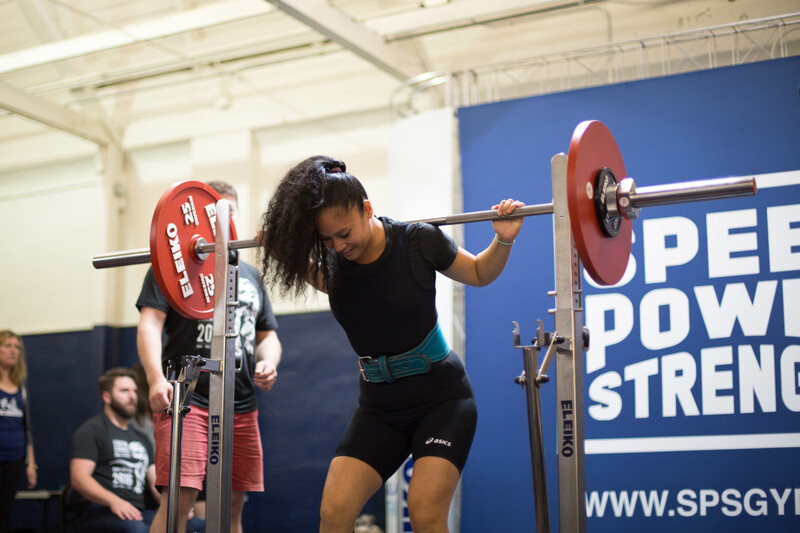 At a meet it is fairly obvious that strength competition is as well. Powerlifting is an amateur sport. There is no major league, and there is no six figure paycheck. National level competitors must compete in local meets in order to qualify for elite competitions. A first time competitor can share the platform with an IPF world champion. This is a unique and special thing in the world of sport. Not only witnessing what a competitor does on the platform, but how they conduct themselves in the warmup room and with the judges can be incredibly informative to a beginner. Although emulating the techniques or programs of elites is largely inappropriate for a novice, looking to seasoned competitors on meet day can show the novice examples of focus, sportsmanship, intensity, and persistence that can be useful for their athletic development. 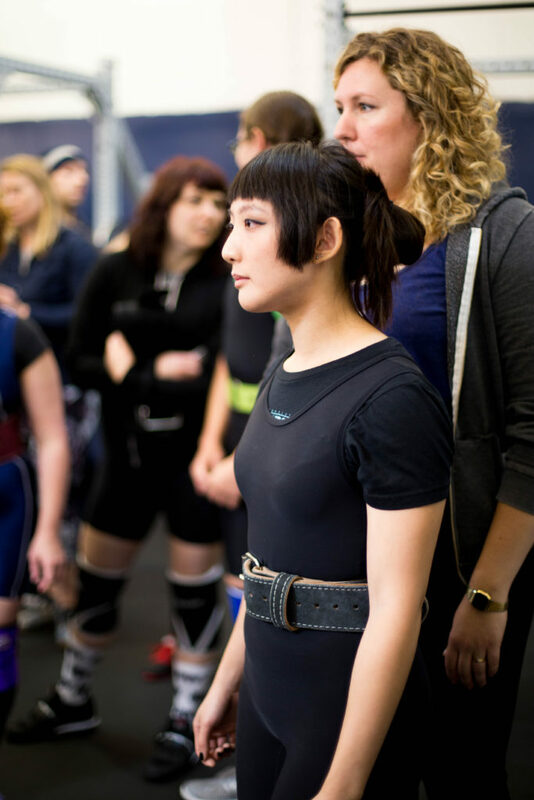 Lifter: Nina Yang. Photo by Petra Smitkova. It is difficult to come out of a 9/9 meet with PRs across the board and not want to get more of that feeling, right away, as soon as possible. The sense of pride in accomplishment after a successful meet is heady, and should be funneled into training as soon as possible. For a novice, that might mean a very slight deload and a continuance of their linear progression. For an advanced novice, perhaps a deload and a brief time of strict LP followed by a return to their previous mid-week light day. Whatever their programming, the novice is in a fine place to recover from the stress of a meet. 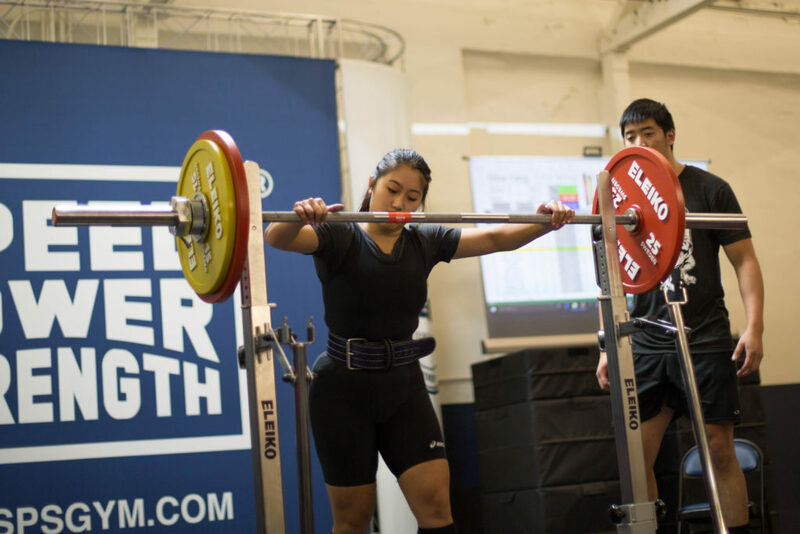 Where intermediate and advanced lifters may find themselves quite depleted after a competition, the novice can still adapt after about 48 hours. The stress of a few heavy singles at that stage in training is likely less than the stress of adding five pounds to their three sets of five every workout. A return to normal programming immediately following a meet utilizes the “good feels” post-meet to support the novice’s commitment to training. If handled properly, this transition back to linear progress will reinforce the purpose of the trainee’s workouts. Now the lifter has seen what the tedious grind of sets of five can accomplish. A thirst for more heavy singles may be awakened, but the efficacy of simplicity and linear progression should be emphasized. With proper perspective – where the novice understands the critical and precious phase in which they find themselves – they will understand that putting their head down and continuing to add weight to their fives is the most important thing they can do to prepare for their next competition. And if the novice and their coach have handled everything properly, a next competition is inevitable. A coach and trainee may find many other areas of growth in a competition. Perhaps a lift that has been lagging will become a new favorite. Confidence may grow, and the relationship between the coach and the lifter may deepen. The experiences shared with teammates will result in camaraderie, another important source of support during training. For all of these reasons, a beginner should not be asked to wait to step onto the platform. It should be encouraged as an essential part of their early progression as a lifter. For more on Novice Competition, you can read Preparing a Novice Lifter for her First Meet by Gwyn Brookes on StartingStrength.com, or Katherine’s interview with Annie Paladino as she prepared for the 2016 Starting Strength Fall Classic. Yes! Also, meets are great opportunities to meet other people in the community, and to bond with friends/teammates/fellow trainees though the shared ritual of competition!! Totally agree! Then you get to see friends you made at other meets. Community is important.